The ocean needs you! With close to 100,000 hours of archived video footage⎯and more being continuously captured by Ocean Networks Canada’s (ONC) underwater cameras⎯you can help scientists answer important questions about the ocean. Play a fun video game that analyzes the behaviour of deep sea marine life. In September 2017, Ocean Networks Canada's (ONC) seismic sensors collected real-time information on two recent and very different earthquakes: one distant earthquake off Mexico’s west coast and a much smaller regional event near Ucluelet, British Columbia. Both seismic events provide insight into British Columbia’s earthquake early warning system, currently in development. For the first time in Canadian history, a group of marine biologists, educators and divers successfully broadcast live across the country from the frigid Arctic Ocean. On Sunday, 27 August, Victoria-based Fish Eye Project climbed aboard the Canada C3 ice breaker in Cambridge Bay and hosted a broadcast that provided Canadians with an opportunity to experience a glimpse of Arctic marine life. In June 2017 Ocean Networks Canada (ONC) hosted a WERA high frequency oceanographic radar workshop to discuss “first ever” real-time data that detected tsunami waves when Typhoon Songda hit the west coast of Canada in October 2016, triggering a tsunami alert on the WERA system. The system is capable of detecting large events, storm surges and tsunamis up to 80 kilometres from shore, which could provide up to 20 minutes of advanced warning of an incoming tsunami. Ocean Networks Canada (ONC) invites short proposals (download Microsoft WORD template) from the research community for in-kind support to research projects that make use of ONC data and will result in publications or theses by early 2020. New for 2018 are some limited ONC resources (mounting, cables, connectors, deployment) to progress auxiliary observations and experiments that would compliment existing installations to enable innovative research. Every year ONC sets out to sea in the northeast Pacific for a few weeks, equipped with remotely operated vehicles (ROV), ocean observing instruments and platforms, and a long list of to-do’s. Working around the clock, the crack team—scientists, engineers, ROV pilots, navigators, communicators, and ship’s crew—contend with unpredictable weather and the mighty abyss to maintain and upgrade ONC’s deep sea ocean observing infrastructure. Wiring the Abyss is a critical undertaking to help us #knowtheocean, and no-one even gets wet. Monitoring the ocean in real-time requires platforms, instruments, cables and sensors in the deep sea. This ocean observing hardware requires high voltage power inputs from shore and delivers big data outputs. Good engineering practices keep the systems running smoothly. In 2017, power and data backup systems on shore are being overhauled after a decade of operations. As we celebrate Canada’s 150 years of confederation, we must do so with full knowledge and pride that our country has been home to Indigenous peoples with advanced governing structures for tens of thousands of years. To kick off Canada’s sesquicentennial on the west coast, ONC channeled #Canada150 celebrations into the deep sea during its most recent expedition aboard exploration vessel (E/V) Nautilus. Did you know, Canada initiated World Oceans Day 25 years ago? In 1992 the Ocean Institute of Canada and the International Centre for Ocean Development proposed the concept of a World Ocean Day at the Earth Summit in Rio de Janeiro. Since it was officially endorsed by the United Nations, 8 June has evolved into a growing annual celebration of our global ocean. The 25th anniversary of World Oceans Day is an opportunity to look in the rear-view mirror to see how far we’ve come and to consider our future, which depends on the health of the great salty engine that drives and supports life on Earth. Ocean exploration is as exciting and complex as traveling into outer space. It involves cool tech, hard science, daring innovation, and a large team of highly qualified personnel. And thanks to underwater cameras and telepresence technology, the public can participate in Ocean Networks Canada’s (ONC) quest to know the ocean. Starting on 28 April, Expedition 2017: Wiring the Abyss is ONC’s first major expedition of the year. 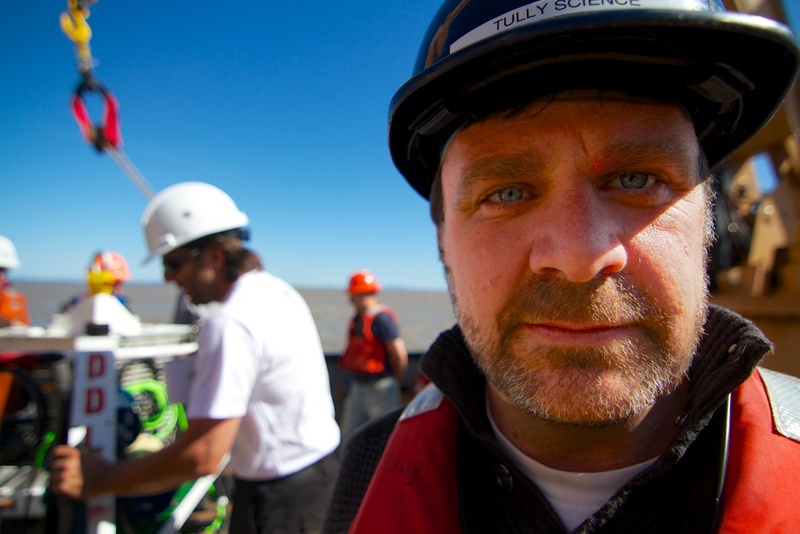 This ten-day operation involves a team of 35 scientists, engineers, technicians, and data specialists who will live aboard the Canadian Coast Guard Vessel John P. Tully. How do you study a moving wall of water and sediment the size of a truck traveling at 30 kilometers per hour? A paper about a spectacular Ocean Networks Canada (ONC) dataset was recently selected as one of science journal Sedimentology’s Top 10 articles of 2016, as an example showcasing “good practice, innovative approaches, and noteworthy advances of our science.” Congratulations to marine geoscientist Gwyn Lintern and colleagues from Natural Resources Canada who published this paper on the tumbling delta dynamics laboratory platform. Coastal communities are facing a variety of rapid environmental changes. Real-time data from cabled observatories can be used by community members to make informed decisions about their coastal and marine resources. In March 2016, ONC continued to push the innovation envelope by deploying three community observatories along the British Columbia coast: in Campbell River, Kitamaat Village, and Prince Rupert. After a year in operation, this first anniversary review celebrates the successes, challenges, and future for ONC’s community observatories. Ocean Networks Canada applauds the Government of Canada’s recent announcements to protect the Pacific coast. During a February visit to Vancouver, the Honourable Dominic Leblanc, Minister of Fisheries, Oceans and Canadian Coast Guard announced a suite of initiatives to ensure that our Pacific coast remains healthy, prosperous and safe for generations. (MEOPAR)—is the first to fly three coordinated gliders. 2017 is a big year for Canada: not only is our pioneer nation celebrating its 150th birthday, but the Canada Foundation for Innovation (CFI) is 20 years old this month. To celebrate this milestone and showcase the far-reaching impact of two decades of Canadian innovation, CFI gathered stories that show how research builds community—making it timely to highlight the international ocean community that has constellated around ONC's world-leading ocean science infrastructure. In November 2016, ONC scientists co-authored a publication in Deep-Sea Research II on the effects of deep-sea bottom trawling on seafloor marine life, already stressed by the naturally low oxygen waters of the north Pacific. This is the first study to measure the effects on the fauna living on the soft-sediment seabed of Vancouver Island’s continental shelf and slope. With media coverage of the recent earthquakes in Italy, New Zealand, Japan, Papua New Guinea, you might be wondering whether earthquake activity is increasing. Long-term earthquake statistics in the last 12 months indicate that it was an average year: there were no earthquakes of M8.0 or higher (one M8.0+ is the annual average) and 19 earthquakes with M7.0 - 7.9 (17 is the annual average). When in doubt, turn to scientific facts, especially in the post-truth era. 2017 began with an icy snap: in early January, British Columbia experienced the first really cold weather in several years. Starting in late 2013, wind and weather patterns over the northeast Pacific shifted, evolving into what has become known as the warm blob. The surface temperatures of this massive region of the northeast Pacific Ocean climbed as much as three degrees Celcius above the seasonal average. While global temperature tracking is suggesting 2016 will follow 2014 and 2015 as the warmest year on record, the effects are acute and immediate in the Canadian Arctic where climate change has already warmed more than twice the global average. This warming is having a dramatic effect on Arctic sea-ice, with reports of both low areal coverage and low total thickness. In June 2014, ONC installed a cabled water column profiling system in Saanich Inlet. The inshore profiling system consists of a surface buoy equipped with a meteorological station and a winch used to raise and lower an underwater instrument package through the water column. This year, University of Victoria postdoctoral researcher Jeff Sorensen is leading a project to study how the chemistry of the Saanich inlet changes over the course of a year. How do you determine when a system has become oxygen deficient, or hypoxic, for the species in our marine ecosystems? Part of the answer comes from mapping where species are found in their habitat and then repeatedly mapping their habitat under changing oxygen conditions.